Preheat oven to 350. Line a baking sheet with parchment paper. Lightly toss the potatoes with olive oil. Roast the potatoes, cut side up for 20 minutes or until fork tender. Allow to cool. Use a melon baller or measuring spoon to scoop out the center of each potato, leaving about 1/4 inch border. Place the potato pulp in a bowl or mini chopper and add remaining ingredients. Pulse until smooth. Spoon in the middle of each potato shell. Sprinkle with paprika, if desired. 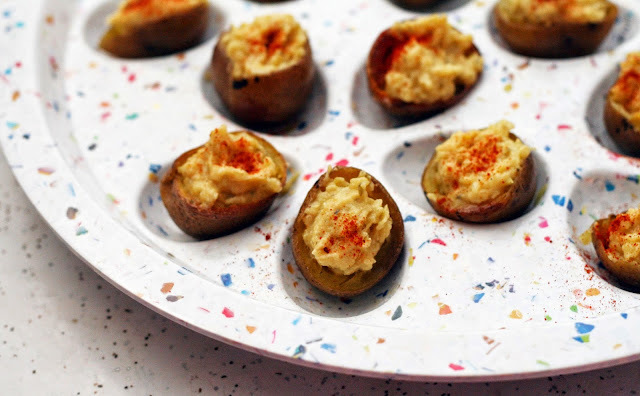 I had the idea to make deviled egg-style potatoes for April Fool's Day but then I thought they'd make a better Easter treat. It was a little tricky to find the perfect potatoes but if you are less picky, you can probably find a bag of "baby" potatoes that are more or less uniform in size in your first trip to the store. I kept the filling simple, basically what I'd do with a real deviled egg, but I really loved the cornichons, they added a lot of flavor for something so tiny! They were a lot of fun to serve and perfect for parties.